First of all, Carol Sulcoski has published two books on the topic of knitting with handpainted yarns and knitting with self-striping yarns, and they are both excellent. So, if you want to get serious about designing with colorful yarns, her two texts are must-reads. Use two different colorways and alternate the yarns every two rows. Use a stitch pattern that either slips stitches over at least one row (any mosaic-like stitch pattern), increases or decreases the number of stitches in a row (like Old Shale), or elongates stitches (like the Koigu Cross Stitch Scarf). Always switch yarns every two rows and cross the new yarn over the old yarn in the same way every time. These three rules allow you to intermix extremely unusual colorways in a way that makes them blend harmoniously and not pool…or at least pool in a pleasing way. 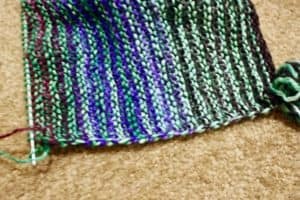 The Ombre Wrap is NOT an example of blending variegated colorways, but it does demonstrate how I switch yarns every two rows and twist the yarns in a consistent way. 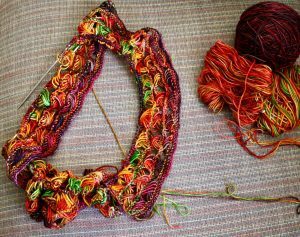 The Koigu Cross Stitch Scarf IS a good example of blending, but since every fourth row is elongated, it\’s a lousy demonstration of carrying the unused yarn up the right-hand edge. Both my current knitting projects are shown above. 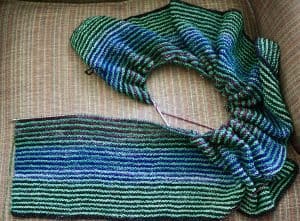 The Ombre Garter Wrap is moving along and I\’m wanting it to end. It\’s about 2/3rds finished, but I\’m not quite sure because I\’m making this one slightly less long than the first one. The Knitted Cross Stitch Scarf was knit enough so I could demonstrate my three color blending rules above. I\’m loving how this one is turning out and I imagine it will sell quickly. I\’m actually breaking two of my rules and using 3 colorways and changing yarn every row. I\’m doing this because two of the yarn colorways are similar enough that it looks more like two colorways, and I\’m also carrying unused yarns up both sides by alternating yarns every row at both the left-hand side and the right-hand side.